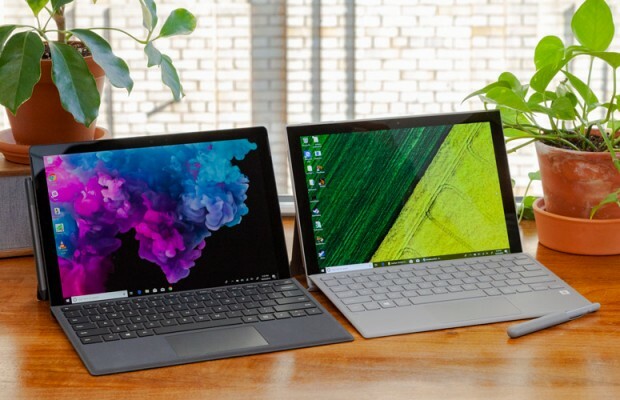 Microsoft Surface Pro has ruled the tablet PC space right out the gate but seems that companies are following on that business model and now we are seeing more and more of these devices in the market. Samsung is known to rival the big guys, whether it be the smartphone market, TVs or anything else that consumers take a liking to. 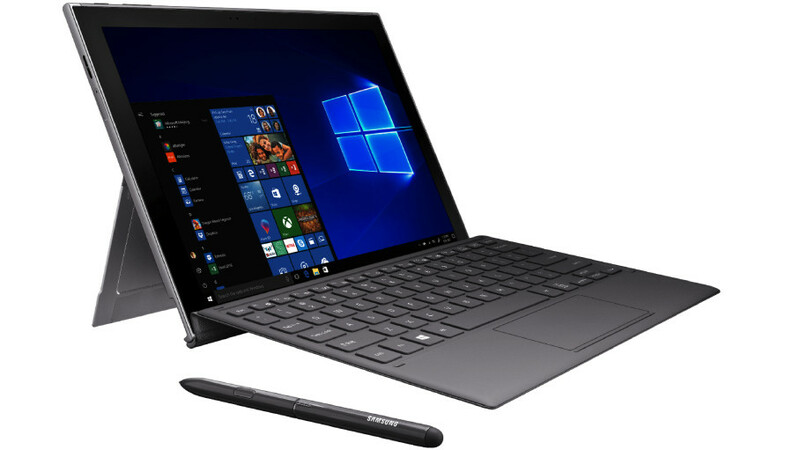 Samsung Galaxy Book is to rival the Surface Pro directly or at least it tries to. Let’s not talk about the processor and the RAM for now. Out of the box, you get the slate with a gorgeous Super AMOLED screen with enough pixels to make your retinas dance plus that contrast of Samsung screens still has no match in the industry. This slate come with a finger print reader located on the back of the device. Which can be quite convenient for quickly unlocking the device, seems rather funny though that this module is withering away from the mobile devices but PC market seems to be picking it up. 3.5 mm Headphone Jack is a welcome addition as well, since most of us are not willing to give up on our old headphones. On the flip side of it though, the device has Bluetooth 5.0 for you wireless audiophiles. One of the biggest selling points attached to this slate is it’s endurance and with 20+ hours of video playback makes this a binge machine and portable on top of it all. Samsung keeps repeating “Always-connected PC” which in my opinion is a toss up. You can use LTE and modern WiFi on this but we all know the battery situation attached to being “fully connected” means a major altitude drop on your battery life. But the good news is that you have the option in case you are an outdoor person or travel lots. Keyboard cover has decent key travel and the trackpad does it’s job but if you are used to better and sturdier external or mechanical ones that you will not be impressed. But it is a free keyboard plus it doubles as cover so not many buyers will complain much. It is back-lit and well lit at that. 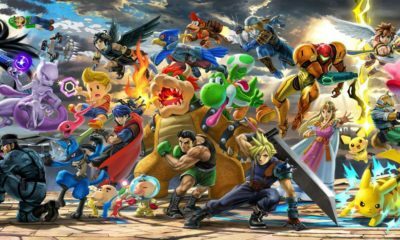 So the company has put a thought or two into it. Using it or simply using it as a cover, up to you. Good amount of key travel and island style keys are pretty standard otherwise. Long hours of typing will make you notice the flex but there are no keyboard covers in the market that don’t. And let me reiterate on this one more time, it comes with the device. The S-Pen has made it’s name and fame via Note smartphones but this particular model is based on Wacom technology. 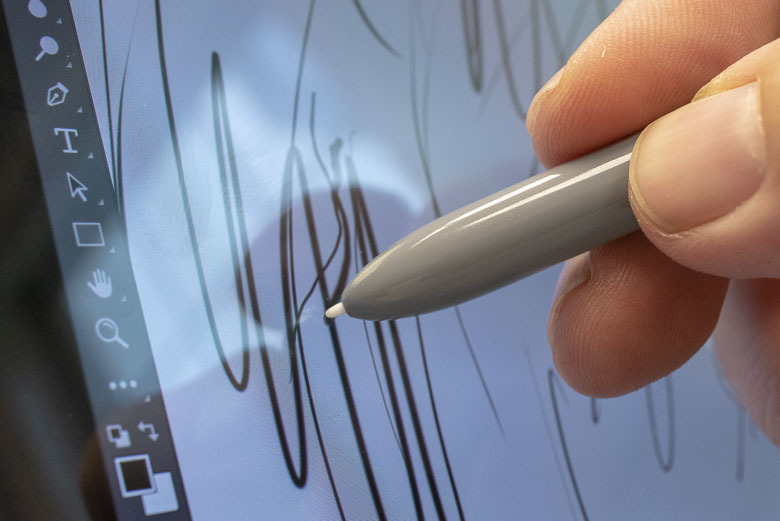 The Pen has an eraser on the back the Wacom’s brilliance in the Stylus space gives this device a ‘pen and paper’ feel. Great for taking notes and obviously light to moderate sketching. The Pen also comes with it’s own cover and extra nibs. The slate also has a place for the S-Pen where it magnetically holds it for you, a bit wobbly but it works if you are sitting in one place and not moving around much. oh, and it has no battery. 4096 levels of pressure sensitivity with palm rejection. 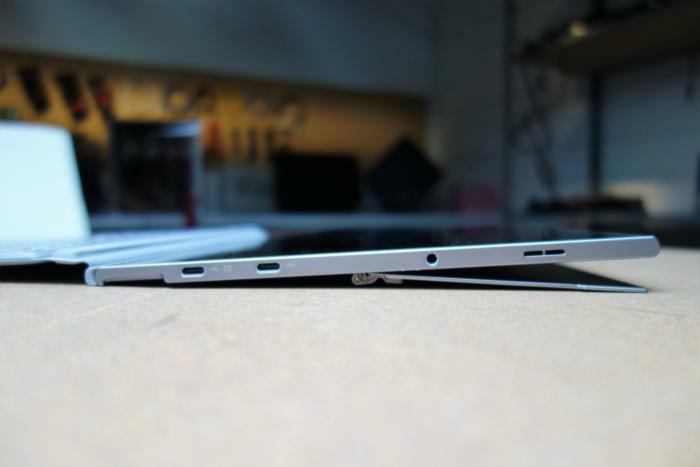 The Surface Pro and it’s out of the world hinges. What can be said about them when there is nothing as flawless as this magnificent feat of engineering. Samsung Galaxy Book2 has taken pretty much all the design points out of the Surface Pro and it is not a bad thing. The kick stand allows great many angles for various needs. Typing, watching movies or simply keeping it laid all the way back. the right side of the device holds all the ports which are not very many but then, a mobile device can’t be expected to have a major I/O grid. 2 x USB Type C (3.1) and a 3.5 mm headphone jack are all you have while the left side of the slate holds the magnet for the S-Pen. 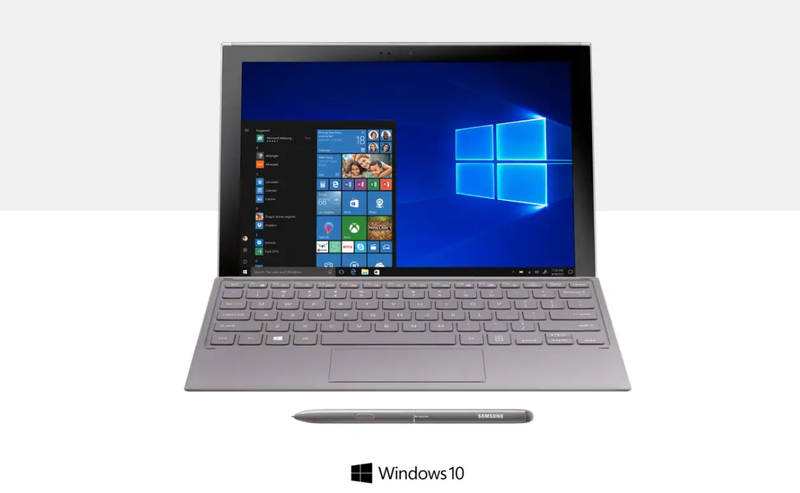 Everything sounds simply great for a daily hybrid PC for regular tasks and benchmarks have shown some good scores but a mobile processor and only 4GB RAM are simply not acceptable for those who use their devices for more than Netflix and internet browsing. Overall, this is a great value product and there is a market for it. But it is not in equal footing with Surface Pro.